We are fast approaching your first birthday. And I’m not really sure how to feel about that. Every day you seem less like my baby girl and more like this curious, comical, confident little person. When I peek into the living room and see you sitting on your knees beside Sam, having a pretend tea party, I swear you look almost as big as he does. 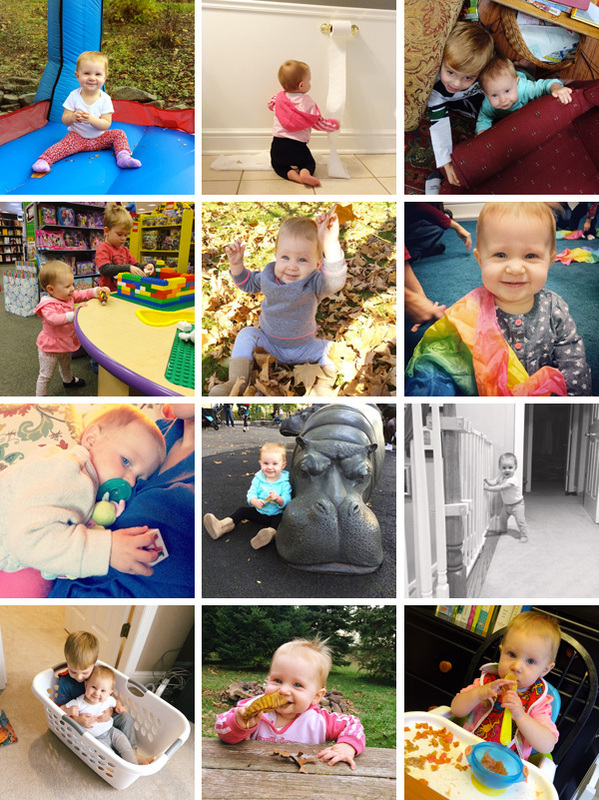 I am simultaneously sad to see babyhood coming to an end and anxious to watch you become a toddler. New tricks include clapping and waving. You love to hide your toys inside boxes and under plastic cups. You intentionally push your animals down the zoo slide and try to put the wooden rings onto your stacking toy and push the colorful beads around the wire maze. Oh, and Sam recently taught you how to pull toilet paper off the roll. You are constantly trying to play with his superhero figurines and Legos. Sometimes he lets you, and sometimes he doesn’t. You try to climb into the Little Tikes car and onto the musical turtle. Basically, you are so much fun! You are crawling everywhere — in fact, you have tiny bruises on your knees from crawling all over the hardwood floors — and you are pulling up onto everything. I find you standing at the back door and at the washing machine and at our bedroom windows. Sometimes you let go for a few seconds, then slowly sit back down. No signs yet of walking, though you are easily cruising across furniture. Your current favorite word is “uh-oh,” and you still say “da-da” way more than “ma-ma.” You may not be talking, but you sure know how to tell us what you want — like more food, your cup of water, or to please get Sam out of your face. I have seen sure signs of sibling rivalry this month. If Sam takes something from your hands, you scream and try to take it back. The two of you often fight for my attention — and my lap. If we’re all sitting on the floor and playing, and you suspect he’s coming for me, you quickly dive headfirst into my lap, then crawl up to my shoulders and wrap your arms around my neck. It’s pretty darn cute. Speaking of demanding my attention, it’s become nearly impossible to dry my hair in the morning, or unload the dishwasher at night, without you hanging on my leg. You bounce and beg for me to pick you up. Sometimes I can distract you for a few minutes with some cloth headbands or a bin of plastic cups, but you always end up in my arms. You still love to ride in the backpack with Daddy and in the laundry basket with Sammy. I tried to get you in the bounce house during a particularly warm October day, but you were a bit scared. Probably because Sam was bouncing around you like a little wild thing. We took a trip to New York City earlier this month to visit Uncle Andrew and Emma and their new puppy, Breck. Not surprisingly, you were intrigued by the hustle and bustle of the big city. But your favorite activity was the Hippopotamus Playground at Riverside Park. It was the perfect place for you to explore. You are still obsessed with Lucy’s water bowl, and I can’t tell you how many times I’ve caught you splashing your hands in it. I’ve also caught you licking the front door and biting the bookcase shelves and sucking on the knobs of the entertainment center. Yuck! While we’re on the subject of germs, Sam has been exposed to a lot more of them since starting preschool. Which, of course, means that you typically catch whatever he has. Hopefully this is all strengthening that little immune system of yours! 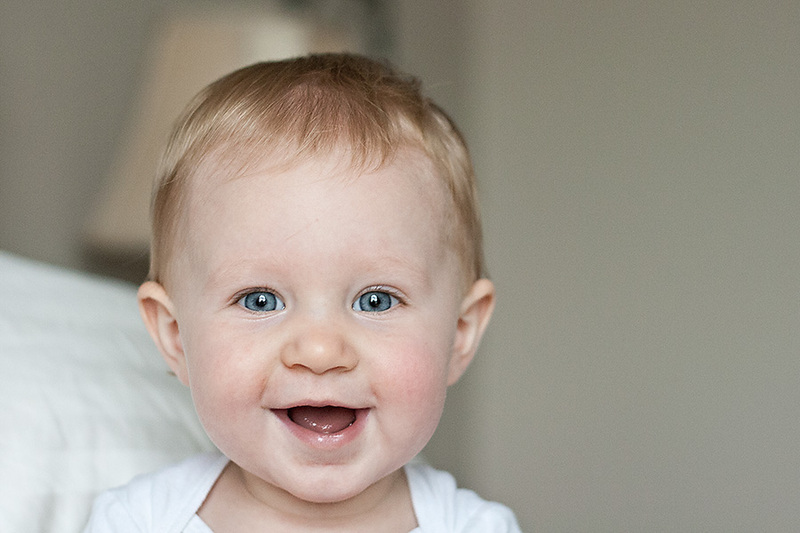 At your 9-month well visit, you weighed 17lbs 3oz (24th percentile) and measured 30in (95th percentile). You are wearing 12-month clothing and some 18-month shirts. And I finally ordered a box of size 3 diapers. Your hair now lays over your ears, and you have random long pieces that nearly touch your eyes. I can’t wait until it’s long enough to pull back with cute barrettes. You got three new teeth this month! Two on the top and one more on the bottom. Their debut was, of course, accompanied by several rough nights. But nothing that couldn’t be calmed by Mommy snuggles and a few extra nursing sessions. Typically, I feed you three times per day, and you eat three solid meals, plus at least one snack. You still love graham crackers and applesauce, and you still dislike eggs and bananas. I now have to order a second Chick-fil-A kids meal just for you, and sometimes you eat more grilled chicken than Sam does. You also love fruit smoothies and milkshakes. You have recently started to lay your head in my lap or on my shoulder, or even on a random blanket or stuffed animal. It is so sweet. So are your grins and giggles. Nora, my heart is so much bigger and so much happier because of you. I can’t wait to see what tomorrow brings!